Dhoni’s ‘Deflect Throw’ method for run-outs, which saves those precious fractions of a second over the conventional ‘gather and dislodge’ method has grabbed eyeballs. 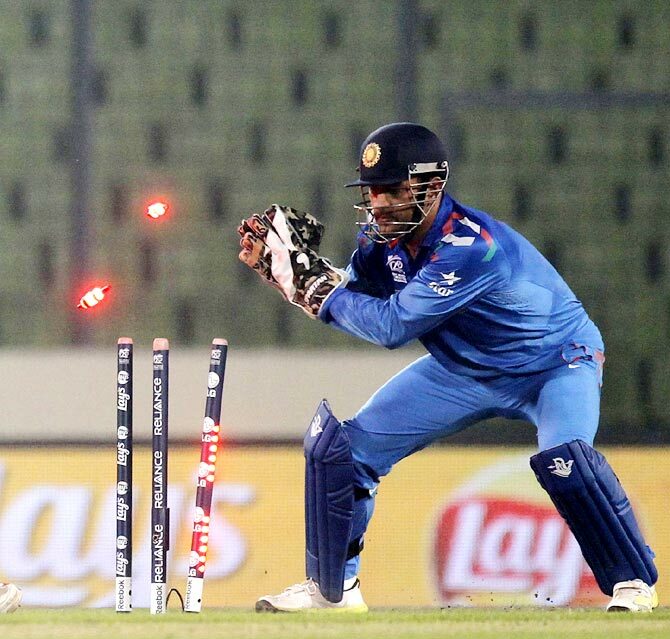 But there’s one other thing that’s caught people’s attention this ICC World Cup season – the LED stumps. While we saw the LED stumps for the first time during the ICC T20 World Cup hosted by Bangladesh in 2014, it’s the first time that in a 50 over’s World Cup series that we are witnessing the glowing timber. With fastest hundreds and fifties’s getting all the glamour, LED stumps developed by Bronte EcKermann’s Zing International has managed to silently sneak into the history books of International Cricket World Cup. Sometime in 2008, Bronte EcKermann hit upon the idea of LED stumps while watching his daughter play with a ball that lit up every time she threw it to the floor. An Industrial Design graduate, EcKermann conducted extensive research for three years and finally came up with a suitable design for LED stumps. His patent WO 2011044642 describes an assembly for indicating movement of an article used in a sporting activity, from a first position or orientation to a second position or orientation. Will Dhoni get EcKermann to give him the glowing timber? The high tech stumps marketed as Zing’s by EcKermann’s Zing International are made up of composite plastic and have touch sensors connected to a microprocessor. David Ligertwood, co-developer of the Zing wicket system, says that their initial idea of LED bails was further extended to stumps as they could contain more LEDs to enhance the experience. Sensors in the spigots of the bails are powered with hidden low voltage batteries and can determine within a thousandth of a second if the wickets are broken. As soon as the bails come off the grove, they send a radio signal to the stumps which also light up. These delicate stump sets are a costly affair. EcKermann’s patented technology costs almost US $40,000 a set and the bails cost as much as an iPhone. EcKermann’s Invention was first tried out in a club game in Adelaide. Impressed with the Zing wicket system, KFC T20 Big Bash League first used them in their 2012 edition. Soon enough, ICC caught up and used them during the semi-final and final matches of the Under-19 Cricket World Cup in UAE. Zing’s quickly rose up the ladder and made it to the T20 World Cup in Bangladesh in 2014 and now has entered the 50-overs World Cup co-hosted by Australia and New Zealand. We all know how much Dhoni loves collecting souvenir stumps and bails. Well in recent times the only man standing in his way has been EcKermann. EcKermann had said after India’s semi-final win over South Africa in the 2014 ICC T20 World Cup in Bangladesh that since the entire set-up during a match costs around $40,000, he wouldn’t allow players to uproot it during any celebrations. But he wouldn’t mind giving Dhoni a souvenir stump if India could win the ICC tournament. Well that didn’t turn out as Dhoni and India would have liked. This time around India has begun their campaign well by scuttling out their arch-rivals Pakistan and turning tables with a win over South Africa. And if they make it to the big final at MCG on March 29th, Dhoni could well have a chance to bring back home two souvenirs from Australia. From swimming alongside sharks to performing with A.R. Rehman, Chinmaya enjoys versatility every day of his life. A sports geek, he enjoys delving into patents that make sporting all the more fair and fun. It is very infromative. Good keep it up !! Didn’t know a set of stumps could have a cool story about their inception. Nice article Chinmaya..